RA (rheumatoid arthritis) can be extremely destructiveto the feet. It can cause many deformities which can lead to pain, ulceration and sometimes amputation. A study done previously has shown that custom orthotics are a great way to help prevent this deformity. 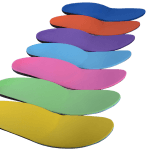 So if you want to help prevent bunions or have a history of RA its important that you get some custom orthotics and and appointment with your podiatrist regular.